These fresh little gems are a real treat! They are bursting with flavor and only available fresh a few weeks a year. These are frozen at their peak of freshness and retain their flavor and nutrients. Notice the "bloom" is still on them. 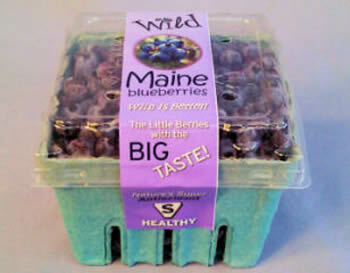 For thousands of years, wild blueberries have been harvested on the rocky fields of Maine. Nurtured and harvested on small, family run farms, these berries only produce every other year. 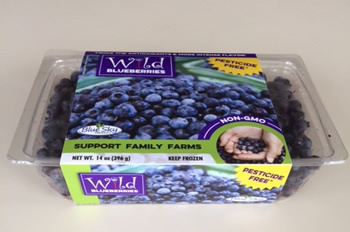 Less than 1% of wild blueberries are harvested fresh? There are 800-1,000 wild blueberries in a pint! They are then run through a line which winnows them (to remove stems and leaves), sizes them (removes the small ones and clumps) and then onto an inspection belt where people remove any remaining ones that are not up to quality standards. Their sweet, tangy taste are matched by their health benefits. They have almost twice the antioxidants as highbush (hybrid) blueberries. 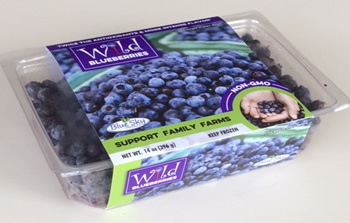 To learn about the health benefits, recipes, history and more, please visit Wild Blueberries.